There are two kinds of BMX bike: freestyle and racing. Racing bikes are designed for getting their rider round the track as quickly as possible. This means they try to be as lightweight as they can be. Freestyle BMX bikes are built for tricks. This means they need to be a fair bit sturdier as its likely that they’re going to be knocked around somewhat. 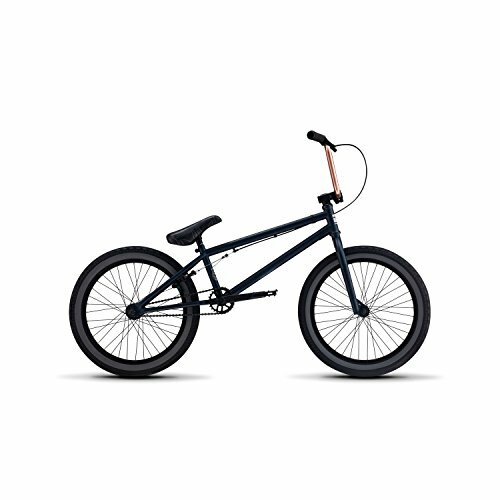 Because of this sturdy design impetus, it means they’re a great investment as a first BMX bike. Of course, you can take your freestyle bike around the track if you want, and if you get into racing, you can think about making a new investment then. But the durability of a freestyle design means that you can put it through its paces around a skate park and expect it to last and last. 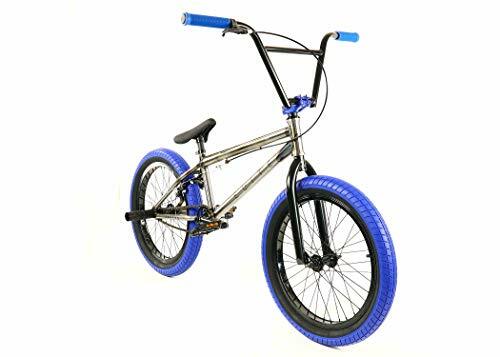 In this article, we’ve taken a look at the of the best freestyle BMX bikes. We’ve given each one a review and then highlighted their best qualities so that you can know exactly what you’re buying. We start off with a seriously impressive bike. It comes near the higher end of the price range we’ve surveyed but with that comes an excellent piece of kit. The frame is made from a combination of Chromoly and Hi-Ten steel with an integrated head tube and sealed mid bottom bracket. This means the frame will be extremely strong and resistant to knocks, without adding a ridiculous amount of weight. The bike features big-box handlebars which make front end lift-off that bit easier and give you more control generally. The tires are 20×2.5 inch, making them fairly thick. This makes the bike well suited for dirt courses and gives it more stability in the skate park. The crank is 100% Chromoly, meaning it will be extremely sturdy. In addition to all this, the bike comes in a beautiful red or black monochrome finish. It’s a great-looking bike. Why We Like It – This is a high-end bike made with high-quality materials. It looks great and will be an excellent bike to start practicing tricks on. The wide tires give you that extra bit of stability while starting out. This bike is designed for entry to intermediate level use. It is supposed to be a starter bike that’ll see you up to legitimate freestyle use. It doesn’t offer lots of unnecessary features, meaning that the price is kept down. 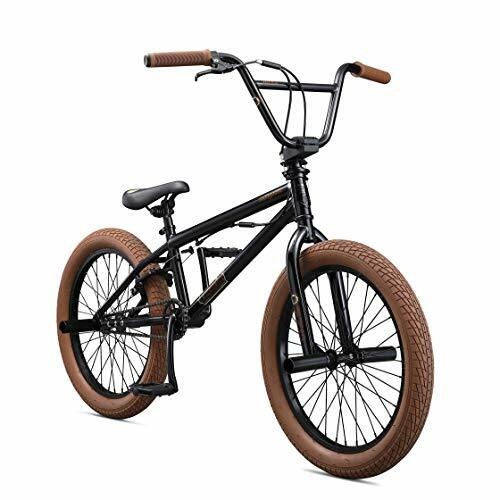 The bike aims itself at the youth market, and while it would be perfect for your child’s first BMX bike, an adult could certainly ride it too. It has a Hi-Ten steel frame which ensures durability when it is being thrashed around a track. This does mean it is slightly heavier and you might struggle to perform some more complicated tricks. The wheelset has an impressive 36 spoke set up, meaning that they’ll stay true even after a bunch of rocky landings. Similarly, the drivetrain is made from the same materials you’d find on higher-end bikes giving the rider a great level of pedal efficiency. It comes in an eye-catching electric-blue/black combo. Why We Like It – For the price, you can’t go far wrong with this bike. It manages to compete with much more expensive bikes at a fraction of the cost. It is definitely worth a look as a starter bike that’ll see you up to a higher level. This is another entry-level BMX designed for kids or young people. 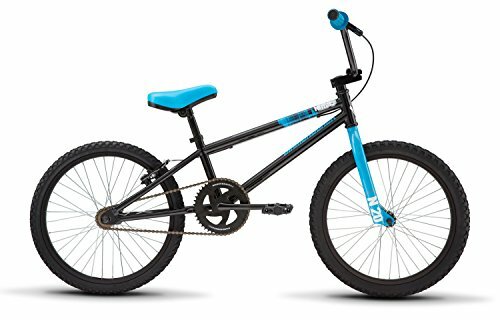 Like most of the bikes reviewed here, it comes with 20-inch tires, which is the standard issue size for all BMX bikes. It has a Tig welded steel frame and fork. This does give it plenty of strength but also means it comes in at a slightly heavier weight. The wheelset is well made, and they have a high number of spokes. It’s a slightly safer bike that can definitely be ridden on roads and paths as well as used on the track. Additional safety is offered by having front and rear brakes: often BMX bikes just have them at the rear. If you’re a safety-conscious parent, this might be something to consider. It also includes pegs and a freestyle rotor, so it is a good place to start practicing your tricks. It is one of the best value bikes we’ve reviewed. 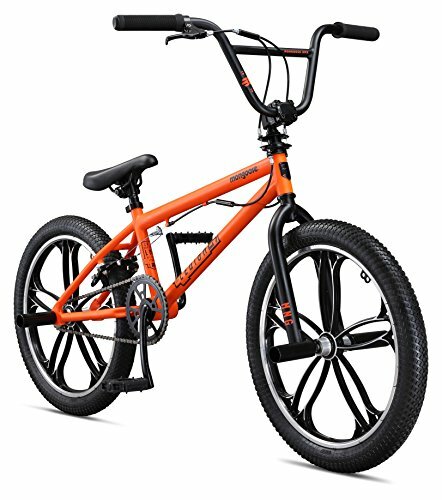 Why We Like It – It would make for a great first BMX bike for a child or beginner. The price represents great value, and you wouldn’t have to worry too much if they’re not so keen on BMX next year. It’s a bike that would be great for practicing tricks on while also taking on short road rides. Mongoose is a well-known brand in the BMX world. They have over 40 years’ experience making BMX bikes, and they put it to good use in all of their products. The Legion L20 provides excellent functionality and is a true freestyle bike, giving you a great ride in the park, on the street, or even on a dirt track. It’s got a Hi-Ten steel frame with Mongoose’s recognized freestyle geometry. It would work well as a kid’s bike, but it could definitely be used by someone older too. The micro driver 25x9T BMX gearing with cassette driver ensure a really high level of pedal efficiency. It comes with four freestyle pegs, meaning you can get going with grinds and other tricks that require pegs. It comes with rear U-brakes and a 360-brake rotor, meaning that even after handlebar spins you can be confident of stopping reliably. In terms of the price point, it comes right in the middle of the bikes we’ve reviewed. It looks great and has to match tan-colored tires and handlebars. Why We Like It – It’s an excellent freestyle bike that would suit someone who wants to explore all aspects of BMX cycling. It’s got some nice features without breaking the bank, and it looks awesome. This is a bike that fits comfortably at the higher-end of what we’ve surveyed. One of its big attractions is its Chromoly frame with an integrated headtube. This means that it sheds weight compared to frames made from Hi-Ten steel. It doesn’t compromise on strength. However, Chromoly being even stronger than Hi-Ten. Lighter weight means that its easier to get more height during tricks, making them easier to perform. If you’re interested in giving racing a go, a lighter-weight bike helps a lot around the track too. It has fully sealed hubs, meaning less friction in the wheels and therefore more efficiency. It has Redline Monster 8.75 inch Chromoly bars, which looks great as well as giving you unparalleled control over the bike. The brake hardware is removable, so if you get really into park cycling, then that is something you might want to consider. Why We Like It – A really well-made bike from Redline. It is made with premium materials meaning that this bike can perform exceptionally well under any circumstances. An investment but one that is worth making if you’re serious about BMX. The Razor Nebula is an entry level bike designed for kids. It has a welded steel frame and form, meaning it is a little heavy and it might be hard to achieve some of the more difficult tricks. This being said, it comes with pegs included so it wouldn’t be something to shy away from. It comes with lots of features that might please parents such as a chainguard to protect your kid’s jeans. In addition, it comes with front and rear brakes, meaning it can ride safely on the road to the park. Even better, reflectors are included which makes your kid more visible to other road users. The aesthetics of this bike are definitely something that is worth considering: it looks great. It comes in white and gold or white and black, and both should please any image-conscious kid. 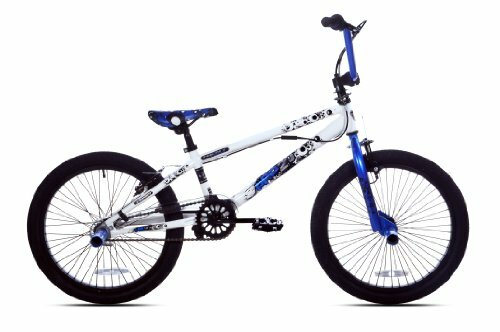 Why We Like It – A great value option for a kid’s BMX bike. It has a bunch of great features that mean it can be used in loads of circumstances. This is a great mid-level bike choice. It features a Hi-Tensile steel frame with a 20″ top tube. This gives it a very respectable weight to strength ratio. It has very chunky 2.4″ wheels that look great as well as giving you a high level of stability in all conditions. The included pedals are high-density plastic which makes them durable as well as lightweight. It has a Tektro alloy U-brake at the rear, which gives great stopping power. The handlebars are lightweight Chromoly and are easily adaptable with an 8.75″ rise. The bike comes with one set of pegs. It comes in a bunch of different aesthetic designs and paints jobs. It’s fair to say they all look stunning, particularly the Raw Blue model which has a clear finish on the beautiful steel frame. Why We Like It – It’s a bike that performs as well as it looks, and it looks great. It’s an excellent mid-range choice for someone who is fairly serious about BMX. It’ll perform well on a variety of terrains thanks to those tires. 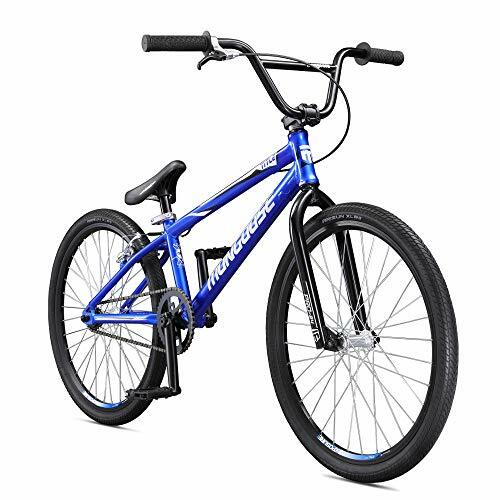 This is a super sturdy BMX bike from Mongoose. It has a Hi-Ten steel frame and is designed for up to the professional level performance. It ships two pairs of axel pegs for those extra trick requirements. It has U-brakes at the rear, offering secure and reliable stopping power. In addition, the 40x16T gearing means that you’ll easily be able to power yourself around the park. There’s also a 170mm crank adding to this pedal power and control. The most noticeable thing about this bike is its cast aluminum mag wheels. They’re durable, lightweight, and look pretty impressive. In addition to this, a built-in cable-detangling system means that 360-degree handlebar spins are never a problem. Why We Like It – This is an exciting bike from a renowned manufacturer. It’s made with good quality material and comes with nearly all the features you could want in a freestyle bike. This bike is squarely aimed at the children’s market. It comes in a variety of shapes and sizes that mean you can pick the size and style that is ideal for your child. It has both front and rear brakes, making it a much safer ride. In addition, there’s a quick release seat post meaning it is ideal for fast growing kids. The frame is made from hydroformed aluminum. This isn’t usually suitable for thrashing around a track but it does give the frame a lightness and so makes it easier for younger riders. 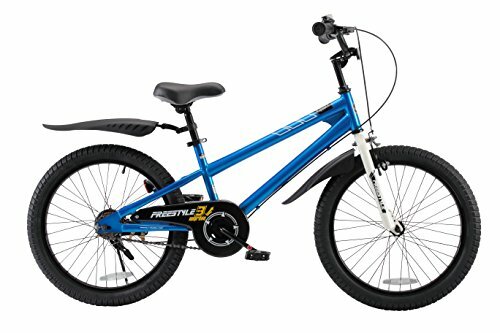 The smaller frame sizes come with training wheels, so this really is a great option for a child that is desperate to learn to ride on a BMX. Why We Like It – If you’ve got a child who loves the idea of BMX but maybe isn’t ready for the skate park just yet, this would be a bike to encourage them to learn on. It is good value and can be adapted for the rider. This is the only bike we’ve reviewed with larger than 20″ wheels. This means it is suitable for rider 5’7″ and taller. It has a lightweight aluminum frame with an integrated headset and internal cable, allowing for handlebar spins. The aluminum frame means it needs a little more care when used purely as a freestyle bike, but it does significantly reduce the weight. In reality, this is a fair amount closer to a racing BMX. 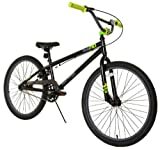 It is designed for new adult riders or those returning to BMX sport. The wheelset features Arisun XLR8 24 inch tires, making it ideal for a taller rider who wants a little bit more height when they’re riding. Why We Like It – This is a bike that’ll give you an impressive time around a BMX track. It’s slightly less well-suited to tricks, but what it lacks there it makes up for in terms of speed. If you’re tall definitely check this bike out. It is definitely worth noting that customization is a huge part of BMX culture. If you immerse yourself in it, you’ll soon learn that most riders tailor their bikes to suit their particular riding style. 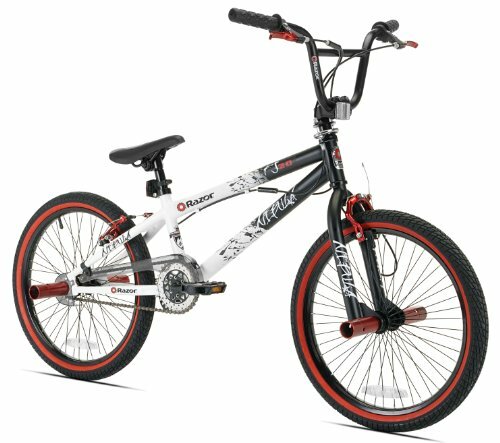 So, what you really should be looking for when you buy your first BMX freestyle bike is a good base model. You don’t need absolutely everything to be just how you want it as you can always change certain components later. This being said, the more you invest in the first stage, the less you’ll have to keep spending on replacements. Below are some of the key considerations to bear in mind when choosing your BMX bike. One thing you can’t replace on your BMX bike is the frame. That’s why it is maybe the most important thing to consider when making your purchase. A true freestyle bike needs to have a really strong frame. This is because of tricky landings and the fact that the frame has to take a lot of beating. As a result, aluminum (a very common material in other kinds of bike frames) is very rarely used, despite being lightweight. If you do want an aluminum frame, be sure you know that it is as durable. The two most common freestyle frames materials are high-tension steel (or, Hi-Ten) and Chromoly. They’re both exceptionally strong and reasonably lightweight. Hi-Ten is the cheaper bike of the two, as it is considerably heavier. The top-of-the-range material is without doubt Chromoly. It is even stronger than Hi-Ten steel while also being considerably lighter. This is great because the lighter the frame, the easier it is to get more air and manipulate the bike during tricks. If you’re really serious about freestyle BMX, then it is sensible to consider an investment in a Chromoly frame. It’ll give you an excellent starting point to build from. Axel pegs are essential for some BMX tricks, especially grinding. They allow you to manipulate the bike in quite specific ways, giving additional pivot points through which you can exert your weight. It depends what you’re looking for from your bike, but if your main aim is heading to the skate park, then you’ll probably want some pegs. They can be placed only on one side, or you can attach four. A lot of the bikes we’ve reviewed include pegs. This means they match the overall design aesthetic which, if that matters to you, is something worth considering. Of course, you can always buy the pegs separately and attach them yourself. Braking is very important for any branch of cycling, but it has a different meaning on BMX freestyle bikes. The more professional the bike is, the less likely it is to have front brakes. This is because they interfere with some tricks and add a little bit of extra weight. And usually, a rear brake is sufficient. The speeds achieved in a skate park usually aren’t actually that high, so very developed braking systems aren’t important. In fact, a lot of freestyle BMX bikers remove their brakes completely. This might be something to bear in mind when making your purchase. However, it really depends on who and what you’re buying your bike for. If you’re riding it anywhere else apart from just the park, you’ll want brakes. If it’s for your child and you know they’ll be riding it on the road you might want the extra piece of mind of having front brakes as well. Although it isn’t that traditional for a freestyle bike, it would give you or your child that extra bit of safety. BMX tires are usually fairly thick. Thick tires mean more balance and generally slightly better grip. If you want to do any dirt riding, you should look at the grips and the width specifically. The wider and grippier, the better your tires will perform in off-road condition. Wide tires lose a little bit of speed, but freestyle bikes are rarely about that. Wheels are also really important as you need them to stay true after several knocks. The way this is achieved is by having plenty of spokes or a forged wheel. This is definitely something worth investing in if you’re a slightly heavier rider, as they’ll be taking more impact. It’s worth noting that 20″ wheels are the standard size for BMX. If you’re extremely tall, you might want to look at a bike with slightly larger wheels. When you’re deciding on your freestyle BMX bike, what really matters is what you’re going to use it for and how serious you are about BMX. Think about where it is you’ll mainly be using it: road, park, or dirt. If you’re mainly going to be taking it to the skate park, then you can afford to get pretty specialized. This might mean you want a Chromoly frame with detachable rear brakes. This will give you plenty of opportunities to perform tricks to your full potential. If, however, you’re shopping for your child and you want a bike that can get you around the streets too, you might be looking for something a bit different. Something with a full brake set is probably worth having. On the plus side, it means you probably won’t need a really high-end frame, and so you can save some money there. Before you decide what to buy, think about how you’re going to use your bike and what it is you’re looking for.